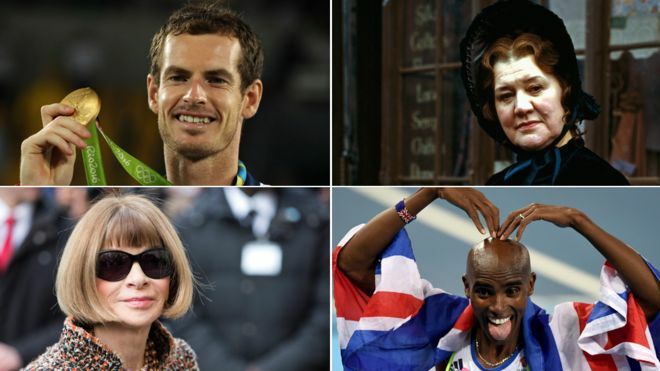 Olympic stars Andy Murray, Mo Farah and Jessica Ennis-Hill are recognised in a New Year Honours list which also includes big names from the entertainment world. 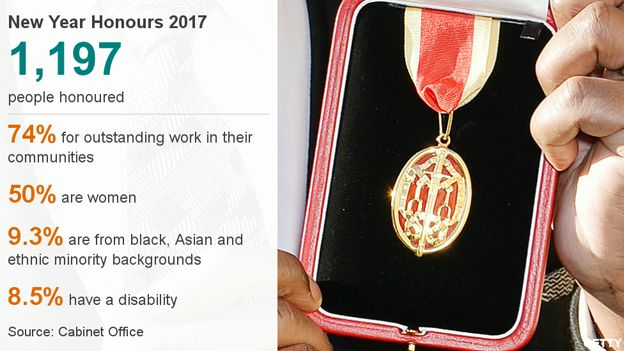 A host of Paralympians also receive honours, including 11-times gold medallist dressage rider Lee Pearson who receives a knighthood. Farah called it a “dream come true” for a boy who had arrived in the UK from war-torn Somalia at the age of eight unable to speak English. From the world of music, The Kinks frontman Ray Davies and opera singer Bryn Terfel receive knighthoods. So too does actor Mark Rylance, the Wolf Hall and Bridge of Spies star recognised for services to the theatre. Patricia Routledge, best known for playing Hyacinth Bucket in TV’s Keeping Up Appearances, is made a dame for services to theatre and charity. Veteran comic Ken Dodd said he felt “highly tickled” to receive a knighthood at the age of 89. Vogue editor-in-chief Anna Wintour is made a dame for services to fashion and journalism. She said she “was very touched to be honoured by a country I care about so deeply”. A total of 1,197 people are on the list, with almost three quarters of them earning recognition for work in their local community. Among them is Alan Woodhouse, the Samaritans’ longest-serving volunteer,who has worked for nearly 57 years at the charity’s Liverpool branch and is appointed MBE. This year sees the greatest proportion of black, Asian and minority ethnic recipients – 9.3% – in the history of the Order of the British Empire. Women make up just over half of those being honoured. Television presenter and campaigner Lynn Faulds Wood has turned down an MBE, saying the honours system is “not fair”. Hillsborough campaigner Prof Phil Scraton refused his OBE as a protest. 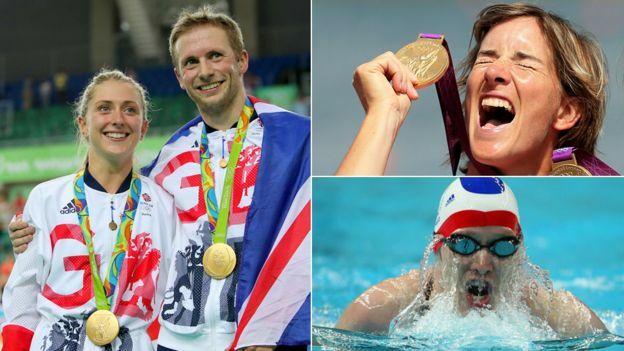 Rio 2016 was Britain’s most successful Olympics ever, and many of Team GB’s stars are recognised with an honour. Rower Katherine Grainger – the first female Olympian to win five medals at five Games – said becoming a dame would be “something to live up to”, while Laura Kenny – the country’s most successful female Olympian – and husband Jason are both appointed CBE for services to cycling. A second married couple who won gold in Rio – hockey captain Kate Richardson-Walsh and her wife and teammate Helen – are appointed OBE and MBE respectively. Kate Richardson-Walsh told the BBC: “To have been given an MBE previously and then to get another letter through the post is very, very special”. Equestrian gold medallists Nick Skelton and Charlotte Dujardin, swimmer Sascha Kindred and para-equestrian Sophie Christiansen are made CBE, while boxer Nicola Adams, cyclist Katie Archibald and cyclist Jody Cundy are appointed OBE. The long list of athletes appointed MBE includes the entire gold medal-winning GB women’s hockey team, swimmer Adam Peaty, wheelchair tennis champion Gordon Reid, sailor Saskia Clark and para-athlete Kadeena Cox. Cox, who competed on the athletics track and in the velodrome at the Rio Paralympics, said her parents were “just massively proud” of her. “They’re proud of everything I’ve done I think – they were proud of the fact I was just sat on a plane going to Rio, let alone all the stuff that’s come with it,” she said. Elsewhere in the world of sport, Chris Coleman is appointed OBE for services to football in recognition of leading Wales to the Euro 2016 semi-finals. There is an MBE too for Michael O’Neill, manager of Northern Ireland, who took them to the knock-out stage. Sir Roger Bannister – the first man to break the four-minute mile in 1954 – is made a Companion of Honour for services to sport at the age of 87. Topping the list in the world of stage and screen, director Sir Richard Eyre is made a Companion of Honour, while percussionist Dame Evelyn Glennie gets the same recognition for services to music. New dame Patricia Routledge said she was “very surprised indeed but very pleased that the honour pertains to theatre”. Among the thespians to be named OBE are Naomie Harris, Helen McCrory and Tim Piggott-Smith, while Oscar-winning costume designer Jenny Beavan receives the same honour. 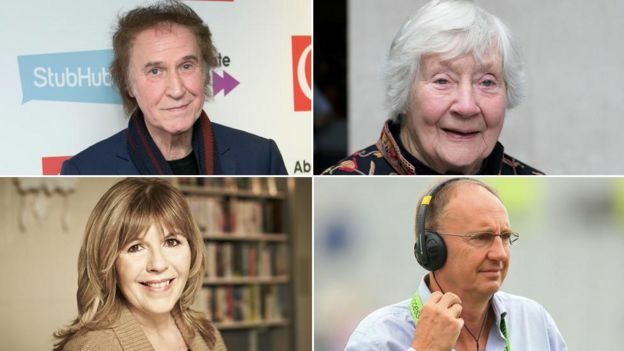 Elsewhere in the arts world, fashion designer Anya Hindmarch, cartoonist Peter Brookes and author and illustrator Shirley Hughes are appointed CBE. So too is veteran broadcaster Angela Rippon, in recognition of her work in dementia care. Victoria Beckham is appointed OBE for services to the fashion industry – 13 years after her footballer husband David received the same honour – while Soho House founder Nick Jones and restaurateur Mark Hix are both appointed MBE for services to hospitality. Also made an MBE is BBC cricket correspondent and Test Match Special commentator Jonathan “Aggers” Agnew. From Westminster, Baroness Shirley Williams is named a Companion of Honour for services to political and public life. The Lib Dem grandee retired from the House of Lords in February after a distinguished parliamentary career stretching back more than 50 years. There are also knighthoods for Conservative MP Julian Brazier, Labour MP David Crausby and former minister and ex-Liberal Democrat MP Steve Webb. A number of party donors are also recognised in the honours list, including Dominic Johnson, associate treasurer of the Conservative Party and now CBE, who gave the Cameron family somewhere to stay when they left Downing Street in July. Northumbria Police Commissioner Vera Baird, an ex-Labour MP, becomes a dame for services to women and equality. Campaigners in various fields are also recognised, including the Right Reverend James Jones – formerly the Bishop of Liverpool – who is knighted in recognition of his role in helping the Hillsborough families. Television presenter Maggie Philbin, best known for Tomorrow’s World in the 80s and 90s, has been appointed OBE in recognition of her work in sparking young peoples’ interest in technology and engineering. For inspiring young people in a different way, adventurer David Hempleman-Adams is made a Knight Commander of the Victorian Order – a personal gift from the Queen – in recognition of his services to the Duke of Edinburgh’s Award scheme. The British Empire Medal was reintroduced in 2012 to recognise achievement or service in the community. One of the oldest recipients is 94-year-old Janet Gillespie, who is awarded a BEM for more than 60 years’ volunteering for Poppy Scotland. In contrast, one of the youngest people honoured is 17-year-old Jeremiah Emmanuel, who receives a BEM for services to young people and the community in London after he founded social justice charity One Big Community (1BC). About 10% of honours are for work in education, including knighthoods for military historian Prof Antony Beevor and Prof Barry Ife, principal of the Guildhall School of Music and Drama. In industry, there is a damehood for Inga Beale, chief executive officer at Lloyd’s of London, and a knighthood for Ian Powell, chairman of financial services firm PWC. At the other end of the business scale, Josh Littlejohn receives an MBE for services to social enterprise and entrepreneurship after he set up sandwich chain Social Bite which helps the homeless. Finally, the first ever honour for services to glassblowing is awarded to Thomas Young, from Bridge of Allan in Stirlingshire. He has been making glass by hand for nearly 60 years and started a business at the age of 77 aiming to train apprentices to follow in his footsteps. Prime Minister Theresa May has set new priorities for future honours lists, wanting them to focus on those who work with children and young people, who encourage social mobility or fight discrimination, or who work in enterprise and business.